The giant space rock, dubbed Asteroid 2006 TS7 or Asteroid 475534, will make a Close Earth Approach in 11 days. Based on NASA’s calculations, the asteroid will come closest to Earth around 12.59pm UK time (11.59am UTC) on Monday, October 29. Astronomers at NASA’s Jet Propulsion Laboratory (JPL) in California estimate TS7 measures somewhere between 492ft and 1,115.5ft (150m and 340m) in diameter. 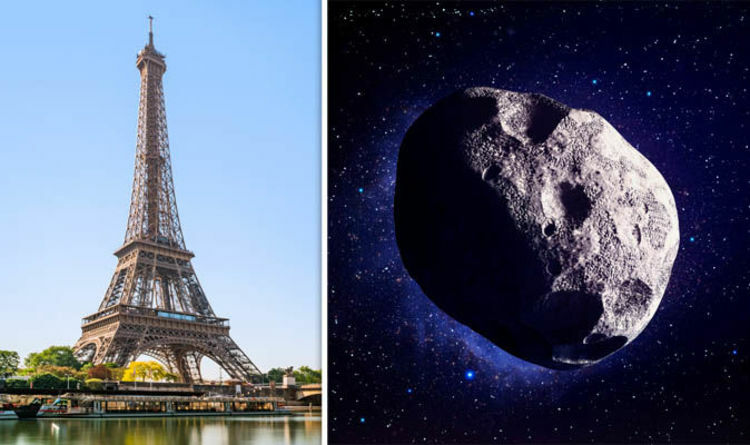 At 1,115 ft, the asteroid stands taller than the Eiffel Tower, San Francisco’s Golden Gate Bridge and is twice the size of St Paul’s Cathedral. The Great Pyramid of Giza, The Statue of Liberty and Big Ben’s clock tower could all fit inside of the barreling asteroid. Even at just 492ft, the asteroid is almost 14-times the length of a London double-decker bus. Accordion to the Purdue University and Imperial College London asteroid impact calculator, an asteroid of this size could cause considerable damage upon impact. If the asteroid struck a city at 40,510mph (18.11 km per second), it could flatten around 0.721 miles (1.16km) of land, creating a cater 1,010ft-deep (309m). READ MORE: Meteor shower 2018: When is the next meteor shower? When are the Orionids? Worse yet, at the higher end of the estimate, the asteroid could flatter more than two miles (3.5km) of land and create a final crater 1,490ft-deep (454m) or worse. Thankfully, there is no concern for the safety of the Earth when the asteroid swings by. Asteroid TS7 will make a so-called Earth Close Approach but the space rock will still be millions of miles from Earth even at its closest. On October 29, the asteroid will come within 0.01930 astronomical units (au) or 1.79 million miles (2.88 million km) from Earth. One astronomical unit is the distance between the Earth and the Sun and is used by astronomers as a reference point when calculating distances in space. In other words, Asteroid TS7 will only come as close 7.51-times the distance from the Earth to the Moon. But the distances in question are still close enough for NASA and other space agencies to pay attention to the asteroid’s trajectory. Because of this, NASA labelled the asteroid a Near-Earth Object or asteroid with an orbit closely approaching that of Earth’s. Once the asteroid safely passes the planet this month, the asteroid will swing around the Sun and return for another Close Earth Approach on October 10, 2019. The asteroid will make a number of returns in the future, with the next pass expected on July 28, 2025, followed by July 16, 2027.